In a national survey on planet biodiversity, it was determined that seven out of ten biologists believe that we are in the midst of a mass extinction of living beings. They rated biodiversity loss as a more serious environmental problem than the depletion of the ozone layer, global warming, and pollution, although these three together may contribute significantly to the crisis, which is occurring because of great damage to the natural systems that purify our air and water. Unlike five previous mass extinctions attributed to natural phenomena, it is believed to be caused by human activity. Critical water shortage alerts have bombarded us in the media lately. Mother nature was scaring us good until a few weeks ago, when the winter rains finally poured down and reservoirs started to fill. Not enough, said County Water Agency staff who alerted everyone to the critical need for stringent conservation even while the crisis diminished. 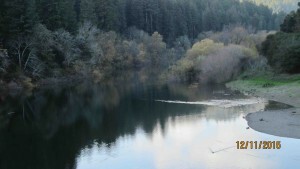 They plan to ask the State Board to declare a state of emergency that would allow the Agency to limit Guerneville flows to 35 cubic feet per second, (normally at least 125). At those flows, there would be no lower river recreational season this year and a great deal of environmental harm could occur. The Sonoma County Water Agency (SCWA) came to Guerneville again last month. In February they arrived with an army of staff to inform us of their plans to divert an extra 26,000 acre feet (AF) from Lake Sonoma for their water customers. In mid-March a few key staff came to warn us about diminished water supplies and lowered flows. It seemed like a contradiction, and I reported earlier that it was, but now there are several new twists. Lawns or canoes? Low flows and water shortage spell severe limits for recreation season…..
Urban water use in Sonoma County and Marin is at least twice as great in summer as in winter. Coupled with high temperatures, it drives the water drawdown up. Much of that extra water goes to watering urban lawns.